My sister’s boyfriend runs multiple half marathons and shorter races throughout each year. Living in the Las Vegas desert, where temperatures top 100 degrees Fahrenheit through most of the year, long runs are impractical. You can’t run outside in such extreme heat for more than half an hour, not even in the morning (as temperatures don’t drop below 80 degrees many days, and that’s already rather hot for running). And running 10+ miles on a treadmill, if the gym will even allow it, isn’t psychologically feasible for most. So how does he train for half marathons? He runs them in the neighborhood of 1:40, so he clearly gets in excellent shape for them. But he attests he certainly doesn’t do long runs. So what does he do? On a long run day, he’ll run 12 miles. But he obviously doesn’t do long runs. What he does is he runs a 4 miler early in the morning, at a comfortably hard pace. This would be a typical quality tempo run for many experienced runners. This might even be (and probably is) his race pace for the half marathon. In the early afternoon, maybe around lunch or so, he’ll go on another 4 mile run. But this is just a regular effort. It’s what a runner may do on a fun run with a group. It may be a feisty moderate pace, or a bit easier, depending on mood. But it’s closer to your typical training run. He’s not necessarily going hard, but he’s making sure not to slack on the effort. Later, towards the evening, he’ll take a final 4 mile run, but this is as easy as he wants. It’s done at a pace you’d do a recovery run, or how you’d do an interval jog between hard reps. He’s just looking to get the miles in at this point, as comfortably as he can. By the end of the day, he’s put in 12 miles of effort, even though he didn’t do it all in an uninterrupted run. Even though he runs regularly as most do throughout the rest of the week… many minds would say in theory he’s not properly, aerobically preparing himself for the distance. His consistent, high quality results in race after race would say otherwise. This may be the perfect template for longer distance training (10Ks and longer) in locales with routine extreme weather, whether extreme heat or extreme cold. Since it may not be reasonable to do the needed long runs in one go, your best bet becomes to break the needed mileage into shorter chunks that are completed throughout the day. This can come in handy not just for runners in hot conditions, but for Chicago runners and others who deal with extreme winter conditions. 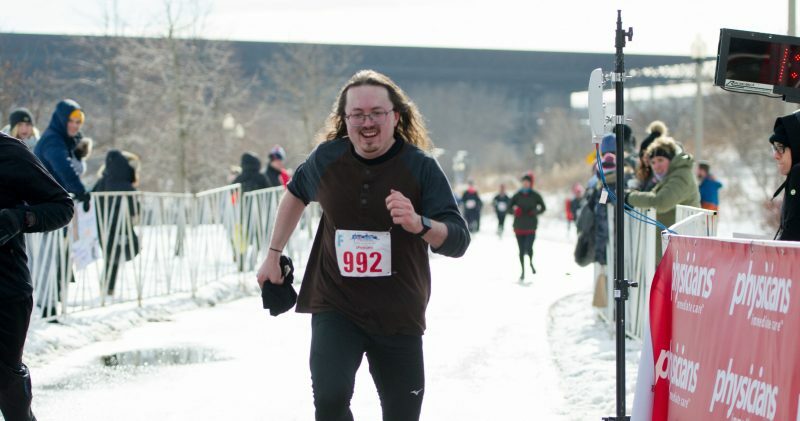 Many can comfortably handle a 10+ mile run in extreme cold, but others find that too daunting. Not only could it be easier to break a long run in extreme cold into shorter 3-6 mile runs throughout the day, but ironically all that repeated exercise in the cold could help warm you up. Repeated exercise will boost your circulation, as well as better acclimate you to the conditions, helping keep you warmer once you’re under shelter. The obvious caveat is that doing this takes discipline. You need to be willing to go outside and run multiple times per day. It needs to be easy and do-able for you logistically. If getting yourself out the door to run is in itself a chore, then you have much bigger challenges to address than getting your mileage in.